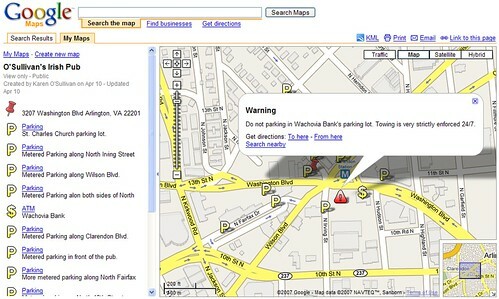 One of the features promised when Google’s My Maps launched was that the content created would be searchable by users. I stumbled upon this feature in action while searching Maps today. This map was created by a local bar, showing customers where they can park. Note the warning about parking in the Wachovia lot. (We have vicious tow operators in our neighborhood that circle like vultures.) You won’t get data like this from TeleAtlas or NAVTEQ; this type of content can only be provided by feet on the street. To see these results on your maps searches, scroll down to the bottom of the listings and click on the link labeled “See user-created content.” The link doesn’t appear for all searches. I couldn’t find a way to force it for searches where it didn’t appear. It’s early and still buggy; if you do a search, switch to user-generated content and then do another search, it defaults to “official” content for the subsequent search. In addition to maps created with Google’s My Maps, this also shows results from sites that use KML like Platial.com and upcoming.org. A few maps that I found: street-food map of Jackson Heights, Dirt Cheap Eats in DC, and Al Capone-related places. Unfortunately, there isn’t a way to see a list of map overlays that are available for a given area. This entry was posted in google, local search, maps, search, web 2, web 2.0. Bookmark the permalink.